Update on the power hammer - I got it moved to its final resting place in the garage, and now I need to put it on some sort of pad. I'm planning to set it on a 3/4" plywood base and secure it with 3/4" concrete wedge anchors. Will a plywood base be OK for this hammer? Yes indeed. Some people like to use 4x4s to get a little more height, but plywood is fine. It's just a 25lb, after all. The main reason to bolt it down is to keep it from walking around the shop, which they will indeed do if not bolted down. 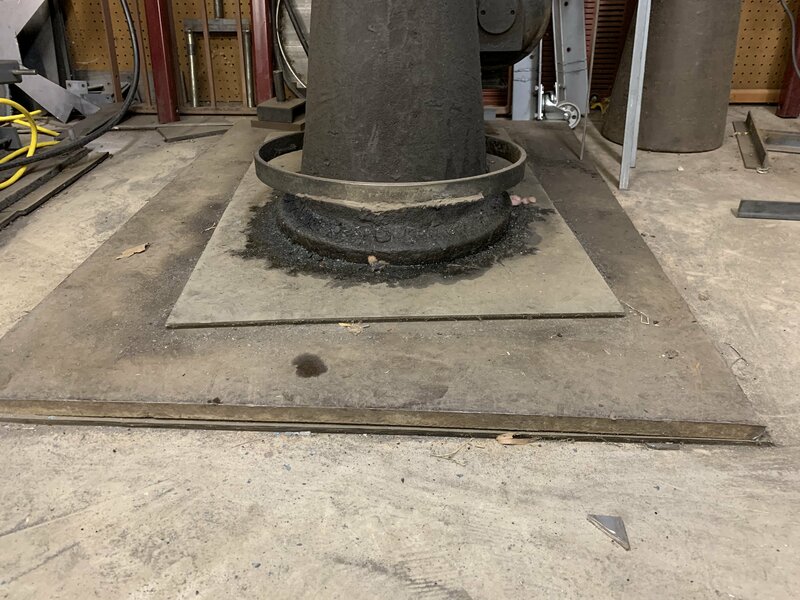 I have some 4" thick 20" by 48" steel plates I would part with...these are former press platens and should be 4140...I have not have them tested. My 50 sits on 1 and I have another soon to operate 50 sitting on another. Thanks Jan. I fear shipping a plate that size would be more money than I can afford! I think I'll go with the plywood since I already have a suitable piece. Interests:Metal working including machine work, grinding and forging. Landscape work. A bit late but I used a piece of conveyer belt on a scrap 3/4 inch steel plate on a piece of conveyer belt. It's worked well for years. No cracks in my 4" slab. Minimal walking. No hold downs. Im lucky I have a conveyer belt company and scrap steel yard near by. I got it set up on the 3/4" plywood and set three of the four anchors before my rotary hammer burned up. I may just skip the fourth anchor as it ain't going anywhere with three 3/4" wedge anchors holding it down. I'm still not happy with the run-on issue. At this point I think the next step would have to be pouring new main bearings. Today I ordered an oxy-acetylene rig. I needed one anyway, and this is just another reason. Does anyone know where I can pick up a pot for melting babbit with propane and a ladle? Rotometals carries pots and ladles for casting. However I don't think that the pots are for use with a torch. They also carry babbit metal. They say that the ladles are not for melting anything under 1000° with a torch but I've done it without any visible damage it.